User Chetan_Gowda writes a diary about Microsoft’s release of 9.8 million building footprint data of 102 cities, covering 44 US states, to the OpenStreetMap community. He finds the general quality of data being good and encourages the local communities to evaluate the quality for import. He is asked in the comment section why he considers the data to be of good quality. Christoph Hormann explains how to accurately map coastlines and tidal zones in OSM, thanks to recent and detailed aerial imagery. Jochen Topf announces another forthcoming multipolygon challenge, concerning “old-style” multipolygons with the same tags on both the relation and the outer way. As these are rendered differently with the 4.0 release of OSM Carto, they may be now noticeable. Volker Schmidt asks how to map a “Verkehrsübungsplatz” – “Traffic training area”. Here is an example. Joachim suggests to map places also as areas. The idea is to introduce a new tag boundary=place and, if necessary, to use boundary relations. Malte Heynen proposes to tag foot and cycleways next to highways with their street classification. Routing engines could then prefer ways far away from the traffic. According to the proposal you would change cycleway=sidepath to cycleway=sidepath:primary. 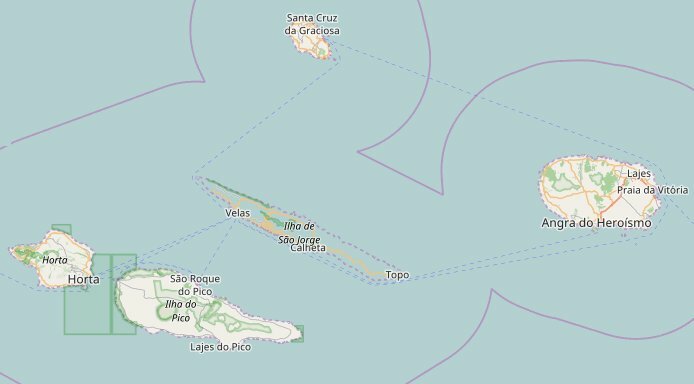 São Jorge Island in the Azores disappeared, reports Topo Lusitania on June 9th on the Portuguese mailing list. Obviously, the issue is still not resolved until the drafting of this edition of weeklyOSM. User Polyglot wants to start doing regular Hangouts on Air about mapping of public transport using JOSM and the PT_Assistant plugin. User marthaleena explains how she is mapping her hometown Visakhapatnam (Andhra Pradesh, India). Pascal Neis published a blog post as a summary of his German talk (slides and video) at the FOSSGIS & OpenStreetMap conference 2017 with the title “Detecting vandalism in OpenStreetMap”. Antoine Riche setup a map of regular OSM meetings in France: these are usually held monthly. Ilya Zverev announced the “Call for Nominees” for the OpenStreetMap Awards 2017. There are some changes compared to last year’s process. As part of its twinning with the rural commune of Dianguirdé in the north-west of Mali, the town of Ivry-sur-Seine mapped the village and its surroundings with the support of CartONG. A user published in the German OSM Forum, parts of the letter, “German Association of Energy and Water Management e.V.”. Hydrants in the OpenFireMap (i.e. in OpenStreetMap) were a thorn in the side of the association. It is feared the security of critical infrastructure. The association disapproved of the letter’s publication. Readers may recall similar issues in the United Kingdom. Simon Poole sent a reminder that an OpenStreetMap organisation entity exists on Transifex where you can now move easily your project for more visibility to volunteer translators. OSMF published the minutes of the Engineering Working Group’s meeting on May 30th. Martijn van Exel informs the Talk-FR mailing list that the French OpenStreetMap association has made an application for local chapter status with OSMF. He asks the community to share any questions, comments or concerns. Sev_osm reports on Twitter about two workshops on using free tools for mapping and geoscience (OSM, QGIS, geOrchestra), taking place from June 12th to 24th in Niamey, Niger. This initiative is supported by “Les Libres Géographes (LLG)“, Projet EOF and OSM communities from Niger, Benin, Burkina Faso and Togo. On June 15th, the Mapbox team in Peru conducted an OpenStreetMap workshop for 4th and 5th grade students at the Mariscal Caceres School in Ayacucho, Peru. Students were amazed to see how easily different geographic data can be added in OpenStreetMap. OSM Peru participated in the “Conference on the reconstruction of peasant cooperatives” (after the devastating floods of the past few months) on June 6th in Lima, Peru. The Drucker Institute at Claremont Graduate University has named the 50 semifinalists for the 2017 Drucker Prize, and HOT is one of them. The winner of the $100,000 Drucker Prize will be announced on September 29th. HOT Indonesia hosts a mapathon with students from the University of Indonesia’s (UI) Department of Geography. Fatima Alher tweets about a mapathon that took place on June 17th in Niamey (see “Events”). It was aimed, through this task, at mapping the surroundings of Diffa, Niger, an area affected by the Boko Haram abuses. See this announce on the HOT mailing list for details. HOT has partnered with the Global Earthquake Model (GEM) and ImageCat on a Challenge Fund focused on developing a global exposure database for multi-hazard risk analysis. The Challenge Fund, formed by the Global Facility for Disaster Reduction and Recovery (GFDRR) and the UK’s Department for International Development (DFID) is aimed at building local and global resilience through innovation in order to better identify risk and enable more effective decision-making. A major new release, 4.0, of CartoCSS is in the process of being rolled out on the OSMF servers. There is no official announcement yet, but many hints in the mailing lists, here and here. One of the big steps forward in increasing the flexibility of the style is the incorporation of LUA pre-processing. HeiGIT @ GIScience Heidelberg released a dedicated stable disaster version of OpenRouteService (ORS) to support humanitarian logistics for Africa, South America and Indonesia with data from OSM. Lokaler Editor, a browser-based tool for creating maps for print on the web, is now in beta stage. It helps journalists to create maps with their own design and enables them to add their own notes. The service offering is a freemium model with among others SVG export, and should start in autumn. The source code will be opened in 2018. User Spanholz named other possibilities for this tool: “I shared it also with my local police forces. They can now easily create maps for festivals or emergency situations, which can accurately show the area while highlighting more necessary informations.” There is a tutorial video as well. pole_climber published a very detailed blog post on how to create a colour coded map about OSM notes, displayed based on last edit date. Milan municipality imported a few drinking fountains’ locations from OSM, therefore prompting (automatic translation) a detailed licensing discussion on the talk-it mailing list. Jean-Maxime Fillau recently contributed to the OSRM project by adding an option to compute a route that ensures the vehicle arrives on the correct side of the road for the destination. This is particularly useful for large vehicles such as delivery trucks and fire engines. Graphhopper is looking for freelancers or companies interested in implementing customizations of the GraphHopper routing engine, jsprit or integrating the GraphHopper Directions API in an application or process. Komoot Android * var 2017-06-14 No infos. Mapillary Android * 3.60 2017-06-14 More robust EXIF reading, fix of stray images upload problems. Mapillary iOS * 4.7.1 2017-06-14 Two bugs fixed. OSRM Backend 5.7.4 2017-06-14 Bugfix release. StreetComplete 0.12 2017-06-16 New languages: Ukrainian and Finnish, warning dialog if user tries to add information not at his location, bugfixes. Kurviger Free * 1.1.0-2 2017-06-17 Changes in navigation, geocoding and UI. Simple GIS Client * 9.1 2017-06-18 Changes for the US Census API service, better memory management for big OSM datasets. … what to do when you find OSM maps used without attribution? … the three-language platform of the Belgian OSM Community? … that Berlin city map on berlin.de portal uses OSM? … that Italian OSM data, updated daily, are available for download on Edmund Mach Foundation servers? Various medias published Delphine Bousquet AFP report on the Benin OSM community. An international research team published an article on Nature about crowdsourced validation of land use data collected by remote sensing. They opened four campaigns on GeoWiki platform, analysed the variations in accuracy, and made the datasets available for further research. The University of Heidelberg is looking for a Software Developer. ResearchNReports published the Global Cloud GIS Market Research Report Forecast 2017-2021, a valuable source of insightful data for business strategists. It provides the Cloud GIS industry overview with growth analysis and historical & futuristic cost, revenue, demand and supply data (as applicable). MapMyIndia claims to be India’s most comprehensive GPS navigation & tracking solutions provider, engaging the user on multiple platforms – mapping India years before Google Maps. While Google Maps is an app that allows users to visualise data, the data provided by MapMyIndia allows users to analyse a detailed array of geo-demographic data. User ff5722 asks if there are really over 4.5 million km of roads in China. Several different estimation methods appear to confirm this figure. OSM only has mapped 1.2 million km of Chinese roads so cannot be used yet, to provide a more detailed analysis. This weeklyOSM was produced by Anne Ghisla, Nakaner, Peda, PierZen, Polyglot, SK53, Spec80, derFred, jcoupey, jinalfoflia, keithonearth, vsandre, wambacher.